I didn't know where to post this, so sorry if this is the wrong place. 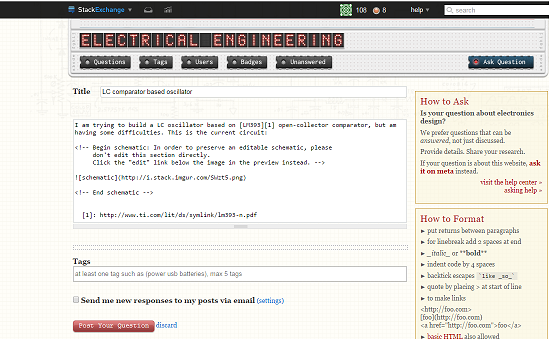 Anyway, I am experiencing some technical difficulties with the EE StackExchange website (or maybe it's just my computer), but I cannot edit/discard a question nor I can include a schematic. This should now be resolved and the fix is live across all sites. Sorry for the inconvenience; I broke it when modifying how the Markdown editor worked for Stack Snippets. Why can't one decide what SE does the question belongs to when flagging?